By Crafts for Learning Contributor, Danielle from the blog Crayonbox Learning. This game was created with a Halloween theme. It can be made up ahead of time for Halloween parties, or given away as treats. 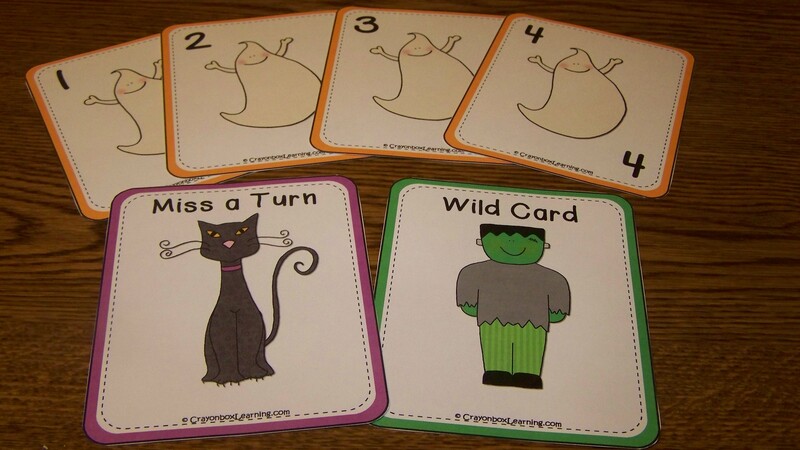 The template provided includes ghost cards that are numbered 1- 12, with a Frankie Wild Card, and a Black Cat Miss a Turn. Print 2-3 sets of the card game depending on how many players you will have. Cut out the individual cards, and laminate for durability. Store in a ziplock bag or small container. Shuffle the sets of cards and deal out all of the cards evenly to each player. Each player will turn their cards face down, taking turns turning one card over at a time. The player with the highest numbered card winds the hand. If a player turns over a “Miss a Turn” card, the player misses the turn and doesn’t get to turn over their next card. If in the event each player turns over the same card, they will continue the process until one of the players wins the hand having the highest number card. This entry was posted in Crafts, Crafts for Learning, Kid's Crafts, Printables and tagged Crafts for Learning on October 28, 2012 by danielle.